Your free pic this week originally hails from promotional material for the obscure game Quiz Capcom World! 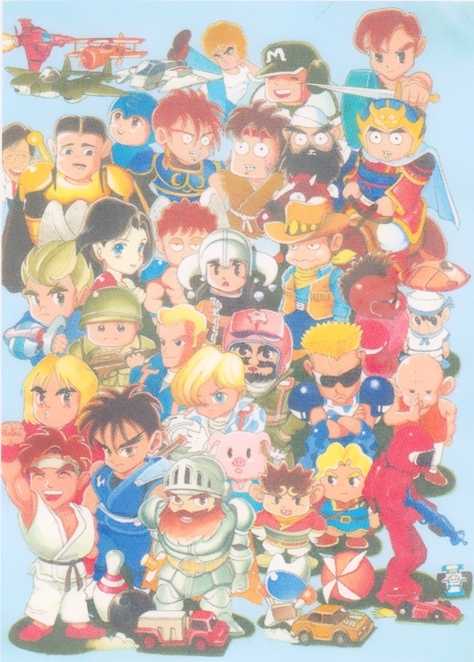 This one stars many Capcom heroes and characters from the 80’s. Mega Man’s hanging out in the upper left corner, admiring the different Capcom aircrafts with a charming child-like sense of wonder. Pretty different from how Mega Man was being portrayed in the US in the late 80’s, that’s for sure! Art by Akiman. 6 Comments to "Friday Pile Up!!" Yeah, I see what you mean. No idea why most of the guys in that row look like they just unexpectedly pooped themselves. It is a bit disturbing. The unknown soldiers are sooooo cool! Great pic! Any friend of the Capcom Database is a friend of mine!